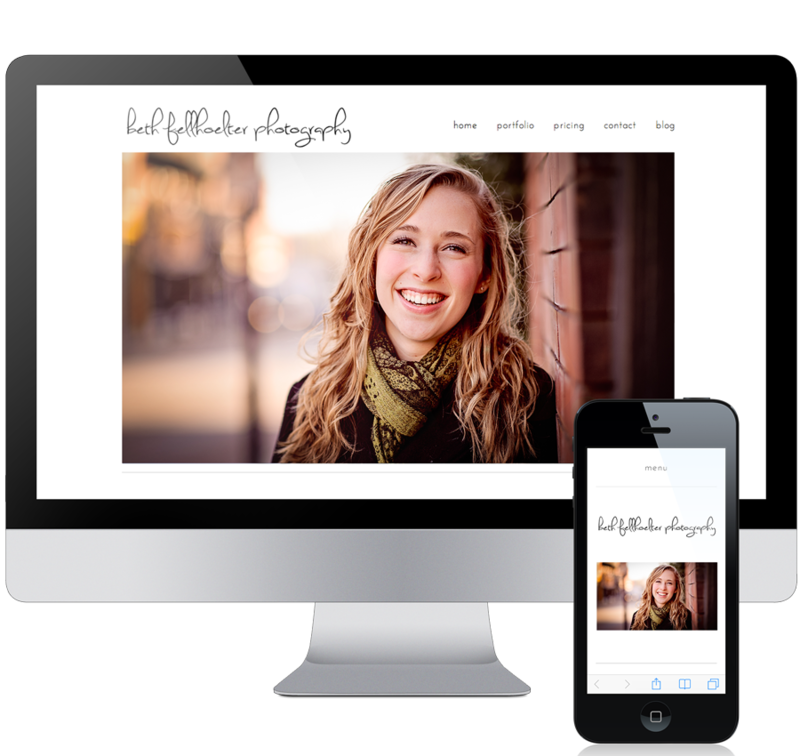 Beth Fellhoelter Photography: What Makes a Perfect Website? Let's be real...designing a website can be SUPER complicated. Besides just the technical-computer-geeky-ness of it all, too many decisions about every little detail can literally drive you out of your mind. But even so, at it's core, I believe there are three key factors that separate the really stellar ones from the ones that just get lost in the shuffle. Steer the ship of design with these three factors in mind, and you'll have a successful website. So what are these magical three factors?!?! Let's find out! Simple- Get to the point. Definitely the most important. If someone has to go searching through your 10,000 page website to figure out who you are and what you do--believe me, they'll never find it. Within moments of landing on your front page, your visitors need to know how you want to serve them, and how they can take the next step to connect with you. It's tempting to want to tell the world about every A+ and "at-a-boy" you've earned since the 2nd grade--but you must resist the urge!!! Keep it simple. Clean- We all remember it--a few years ago, there was that old "I love pirates" website, with there was that burned-up-edges-old-treasure-map background and the nice, gentle, pirate-y music. Heck there was even a little cartoon parrot that moved around every now and then and squawked. We all ooh-ed and aah-ed back then. Well we have a word for that now. CHEESE. Total cheese ball. Here in the 21st century, things have changed. Clean. Bright. Minimalistic. These are all very good words in the design world these days. Don't clog up your site and distract your visitors with a bunch of fluff. The more there is to look at, the better chance they're going to miss what you really want them to see. Beautiful- Of course all three of these factors are very closely related, but it is certainly possible to be simple and clean, but still pretty ugly. This is where the artist's touch comes in to play. Besides just telling people how great your business or service is, you want them to feel good when they visit your site. Composition and design are more than just rules--it's an art. (Duh.) Don't just make it work. Make it pretty. Beth Fellhoelter is a friend of mine who also happens to take AMAZING photos of people, places, and things. As she recently begin to make the transition from treating photography as a hobby to a profitable profession, she decided (and rightly so) that she needed a simple, clean, beautiful website...and that's where I came in! It's simple. From the moment you step onto her website, you know exactly what she does. She takes pictures. Pictures that are stunning. Pictures that capture and reflect true emotion and personality. You see them as soon as you look at the front page. The page tabs are easily identifiable and self-explanatory. You know how to get in touch with her. Plus it's clean. There aren't a bunch of frills and fluff. There is no amorphous clutter of non-important info to distract your attention from what really matters--the photos. And of course, she didn't need much help to make it all look beautiful. The photos do the trick! If you asked me, I think we pretty much hit the nail on the head with this one. Take a look at bethfphoto.com to see for yourself.